Itzabots are robot shaped ceramic planters that kids can customize with any of the included mix and match stickers. Create and recreate new companion as many times as kids like. 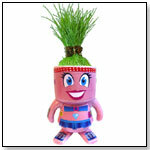 When kids fill the planter with water and give it a little light, their itzabot will begin to sprout a thick head of grass "hair" within 5-7 days. The hair will continue to grow for 2 months with continued watering and styling. Available in three styles/sticker kits: Monster, Girl, and Robot. A happy tune and saying–reminding him to lower the seat when he’s done. A flashing LED light every 15 seconds lets users know when he’s left the seat up in the middle of the night. 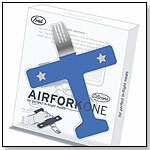 Peel-and-stick adhesive backing attaches easily to the flat underside of any toilet seat. Hygienic, water resistant case. Zowa are fun toy puzzle erasers that kids can collect and trade with their friends. Series 1 has over 50 erasers to collect in 5 different themes: Fantasy, Jobs, Imagination, Sport, and Monster. Find all the rare erasers which come in white. The more Zowa one collects the bigger the Zowa World becomes. Zowa are available in a single pack or a 3 pack. Launch date: 2012. A reproduction of the original 1968 Fisher Price toy, this camera includes 3 interchangeable picture disks that are advanced by pressing the "shutter" button. Other features include a take along strap for the aspiring photographer on the go and a rotating flash cube. Crayon Necklace by KIKKERLAND DESIGN INC.
A retro replica of the candy necklace. Each bead is one of six different colored crayons. Non-toxic. 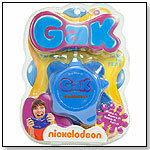 Nickelodeon Gak - Blue by NSI INTERNATIONAL INC.
Other products from NSI INTERNATIONAL INC.
Nickelodeon Gak is back. The Nickelodeon Gak - Blue is the incredible squishable, squeezable, squashable, stretchable, bounceable, ploppable, poppable stuff. Gak's "Splat" container lets kids make all sorts of wacky sounds when they squish the Gak around. Smoosh it, Twist it, Bubble It, Mix it. •FINAL GIVEAWAY CONTEST FOR 2012!